To improve the performance of R35 GT-R using the factory Head gasket, the factory bore sealing proof stress restricts the improvement. GT800 Package can release the restriction by replacing the Head gasket with the HKS Head Gasket which enables higher performance. This HKS Head Gasket includes the Exhaust Manifold Gasket. Best to use with GT800 Package to upgrade the engine properly. High engine output parts. Designed to replace the factory Head gasket. The bore diameter and thickness are the same as the factory gasket. The shape of the exhaust gasket is the same as the factory gasket. The compression ratio of HKS Head Gasket isε9.0 which is the same as the factory ratio. To maintain the bore seal proof stress, the stopper's height was changed to 0.15mm from 0.10mm. Narrowing the width enables the high proof stress with the factory Head Bolt axial tension. Also, optimizing the bead plate's angle improved the seal pressure of the contacted surfaces of the oil and coolant seal parts without affecting the bore seal pressure of contacted surfaces. The surface of the gasket was fully coated instead of only bead part of the factory gasket's surface like the factory gasket. Fully coated gasket's surface can improve the rigid connection of the cylinder head and block when installing the gasket. The Exhaust Manifold Gasket has the 4-layer bead plate comparing the factory 3-layer bead plate so the seal durability was improved to be used under high exhaust pressure. The bore stopper and bead are separated as placing the stopper that the tightening force is concentrated around the bore, and placing the bead around the stopper. The bore stopper load can be increased with this design, which is not possible with the factory combined type. Also, the separated type can prevent the cylinder head and cylinder from deforming since the stopper is located inside the hard bead plate. 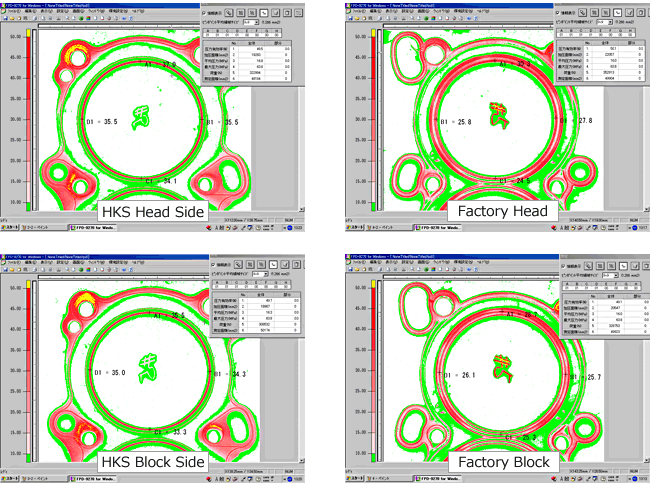 * HKS Head Gasket is more durable, the pressure is applied equally comparing to the factory gasket. VR38DETT 0.8 ε=9.0 φ96 23009-AN010 Exhaust manifold gasket included.